When I first moved to Forest Gate in the late 1980s I lived on Tower Hamlets Road and my walk to the station took me past a small group of almshouses on the corner of Forest Lane and Odessa Road. The buildings are single storey, small, plain and with gabled fronts. Although I didn’t know it at the time, this was known as the Forest Gate Retreat. The retreat was built by Jabez Legg, who was a Congregational Minister of the Forest Gate church in Sebert Road. He built three almshouses in 1858 and three more in 1863 to accommodate women who had formerly been in domestic service. In 1939 the charity was amalgamated with the Edith Whittuck charity of Wimbledon and renamed the Legg-Whittuck Trust. The Alms-women who live in the retreat can come from any part of the country, but in practice most of them have local connections. In August 2012 the Legg-Whittuck Trust joined Pathways, a not-for-profit organisation which builds, transforms and supports people and communities to reach their full potential. Pathways now manage the Forest Gate Retreat. Last week the Department for Education finally acceded to a number of Freedom of Information requests and published a full list of all proposals for new free schools it has received, including information about the proposed religious character of the schools, if stated. The council has a somewhat ambiguous attitude to free schools. On the one hand, the Labour party is opposed to them and councillor John Gray seconded a motion at the recent London Labour conference to that effect. On the other hand, the mayor has granted a lease on the former offices of the education department in Stratford to the London Academy of Excellence on very generous terms, including the first year rent-free. I am governor of a Newham school and I am personally opposed to the coalition government’s schools policy. 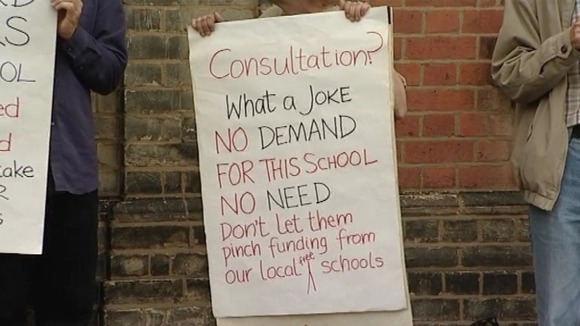 Free schools are an ideological experiment that is diverting resources away from existing schools, whilst academies represent an unprecedented centralisation of control, removing local authorities from their proper place in managing local provision. Giving public money to fringe sects (of whatever religion) to set up new ‘faith schools’ is a recipe for division and disaster. We need our young people to be educated together, side by side, not separated off into sectarian and confessional ghettoes. Please let me know in the comments if there’s anything else I’ve missed. UPDATE: The student who organised the debate has written an open letter to Galloway, saying the MP’s actions left him feeling “humiliated in front of a room full of people who had waited an hour and a half” to see the debate. He rejects Galloway’s claims that he had been “misled” and “deceived” about his opponent. So far Galloway has not responded, so maybe “apologise” and “act with grace and humility” are two more things we can add to the list of things George doesn’t do. Gareth Bale’s glorious second goal against Lyon in the Europa League, as seen from the crowd. I didn’t shoot this video (honest!) but whoever did sits not more than a dozen or so seats away from me. Twitter announced at the weekend that it was closing down Posterous, almost exactly a year after it bought the business. It was pretty clear at the time that this was about hiring the talent behind Posterous rather than acquiring the service and its millions of users. Nonetheless the news has caught people by surprise and left them looking for a new home for their blogs. So right now I am working to shift the site over to WordPress.com. Most of the content is now here, I just need to do some tweaking to the tags and categories, and then re-direct the forestgate.net domain to point at the new site. One of these men is a posturing self-publicist. The other is Pete Burns. George Galloway wants to free Newham from the shackles of the hated Wales dictatorship. He is promising a “Newham Spring” that will sweep Sir Robin from power and install, er, George Galloway in his place. Sir, I salute your courage, your strength, your indefatigability, and I want you to know that we are with you, until victory, until victory, until Jerusalem! All dignified people in the world, whether Arabs or Muslims or others with dignity, are very proud of the speech made by president Bashar al-Assad a few days ago here in Damascus. For me he is the last Arab ruler, and Syria is the last Arab country. It is the fortress of the remaining dignity of the Arabs, and that’s why I’m proud to be here. Much as I would love to see the back of Robin Wales I won’t be taking any lessons in dealing with dictators from George Galloway. The Church of England was the custodian of marriage in Britain for hundreds of years. For many people, it still is. The 1662 version of the Church of England service, which has been in use for the past 350 years, sets out three reasons for marriage. The first is that it was “ordained for the procreation of children, to be brought up in the fear and nurture of the Lord”. The central problem with the Bill is that it introduces a definition of marriage that includes the second and third reasons but drops that first one. The result is something that is a good deal weaker than the original. My right hon. Friend was at my wedding. I was not young when I got married, and unless I had been blessed like Elizabeth, it was highly unlikely that I was going to be able to procreate after all that time. Is he telling me that my marriage is less valid than anybody else’s? No, I am certainly not. I was delighted to attend my hon. Friend’s wedding. The reason that I have just cited was applicable 351 years ago as well, but the Church of England service still applies. Children are at the heart of marriage but they are barely mentioned in the Bill. It aims to open up the benefits of marriage to people who are excluded from it at the moment, but it does so at the price of taking away a significant part of the meaning of marriage. Children are the reason that marriage has always been so important… it is right for society to recognise—as marriage does—the value to all of us of the contribution of those who bring children into the world and bring them up. That is the ideal that the current definition of marriage reflects, and it would be a mistake to lose the value that that definition places on the creation and bringing up of children. Like Lyn Brown, I am married but childless. And I am pleased that she stood up to Timms on behalf of all of us in that happy condition.